Seeds of Destruction (2011) - Sci-fi-central.com.  Canada / USA  2011  90m   Directed by: Paul Ziller.  Starring: Adrian Pasdar, Stefanie von Pfetten, Jesse Moss, Luisa D'Oliveira, James Morrison, David Richmond-Peck, Daniel Bacon, Ben Cotton, Don Thompson, Nicholas Carella, Adrian Holmes, David Lewis.  Music by: Michael Neilson. With some notable exceptions, God has a history of killing everyone on planet Earth. But don't let that ruin the story for you; perhaps, He is merely giving the characters in "The Terror Beneath" a very scary warning. And, if you want to say God was sleeping on the job when He let the seeds out of the Garden, remember He also let in a nasty snake. God may have some good seeds up His sleeve. Of course, it's also possible God has no active participation in story. Syfy director Paul Ziller should know for sure, since he was also part of the writing team. The credit "Produced by Raymond Massey" refers to the grandson of the original. The greatest special effect is a wobbly camera. The landscaping, before camera shaken, is nice. This dumb movie was retitled "Seeds of Destruction" for home video release. The Terror Beneath (2011-10-08) Paul Ziller ~ Jesse Moss, Luisa D'Oliveira, Adrian Pasdar, Stefanie von Pfetten. Review by wes-connors from the Internet Movie Database. 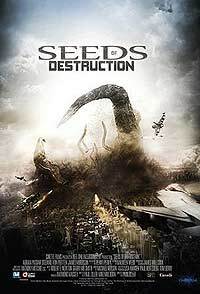 Seeds of Destruction (2011) (aka: The Terror Beneath). ''Seeds of Destruction'' Movie Review.